1h20 from Paris, 2h from London, 1h50 from Amsterdam and Cologne, 30 minutes from Lille: Brussels is at the centre of Europe. 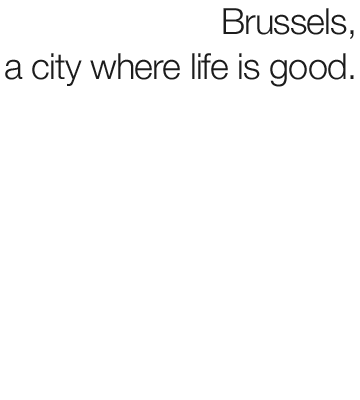 As the heart of the European Union, Brussels has gradually become one of the most cosmopolitan cities in Europe, while having none of the disadvantages of a megacity. It is a welcoming melting pot where the young and old alike come to live, socialize, work and study; the approximate 1,100,000 residents represent multiple nationalities and cultures. Brussels is a very dynamic city but retains a quality of life uncommon for a large capital. The large mix of European and other cultures brings great cultural wealth to this city, which is known for being a hub for developing highly valued, creative students and renowned, professional creators. Big names in design (many of whom are teachers at the CAD), advertising (Belgium is always well positioned during the Golden Lions at Cannes), fashion design, cinema, comics, music, theatre, dance, etc. showcase their creations in Brussels but also elsewhere throughout the world. Students adapt and live here well because they are appreciated and welcomed with open arms. Going out and having fun, while feeling safe, is one of the big advantages of this city. Additionally, it is very easy to find housing for students in Brussels and at particularly affordable prices, which is very rare in major capital cities. The CAD is nestled in lush greenery in Uccle, a beautiful residential area in the south of Brussels. It is well-served by public transportation, and it is, among other things, only a 9-minute tram ride from the South Station where one can take the TGV, Thalys and Eurostar. The French were, by far, one of the first to adopt Brussels, and students and professionals have found a welcoming and sweet place to live, quite literally at the gates of Paris. Interestingly, 50% of CAD students come from the four corners of Europe. They ultimately feel very comfortable and, thus, quickly and easily integrate not only into their new college, but also into the city.